Anaglypta remains one of the most respected and recognisable names in wall coverings in the UK. 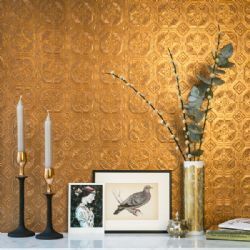 Founded in 1887 by Thomas Palmer and now in its 126th year, Anaglypta continues to thrive by adding new lines to its repertoire of stunning traditional designs. Blending durability and quality, Anaglypta wall coverings will stand the test of time and add a touch of luxury and opulence to any period or contemporary property. We do carry the full Anaglypta range of wall coverings, so if there is a product that you require, please feel free to give us a call on 01723 321333 and speak to one of our friendly customer service team.